A woman rushed to help a stranger in Gardner, Massachusetts, after realizing the man's leg was stuck on a train. 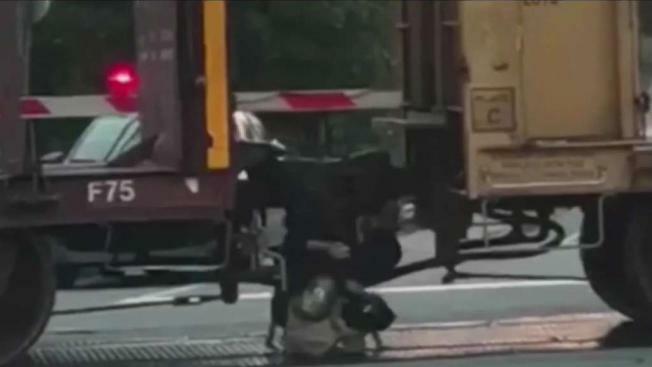 A man in Gardner, Massachusetts, was saved after his leg got caught on a freight train Sunday night. When the man helplessly fell to the ground, Jennifer Ringuette's heart fell in her chest. "My fear was the train starting to move and his legs getting run over," said Ringuette, a Gardner resident. It happened on West Broadway in Gardner as the train was blocking the road. The entire encounter was caught on camera. The man was trying to cross the tracks to get to his home nearby. His leg got hooked on the train and he couldn't shake it loose. "He had a metal prosthetic leg and he couldn't feel it," said Ringuette. "When he got stuck, he couldn't move it on his own." Ringuette, who was waiting for the train to pass, put her car in park and ran over. "I was praying the whole time. I was just saying, 'Please, God, do not move this car,'" said Ringuette. She climbed between the train cars, hopped over to the other side and freed his leg before the train started rolling again. "I believe God puts people into people's lives at the right place and at the right time, for a reason, and I was meant to do that," said Ringuette. Her advice is if you see someone struggling, put yourself in their position and see how you can help.